Let’s Paint the Chickweed Moth! – Let's Paint Nature! 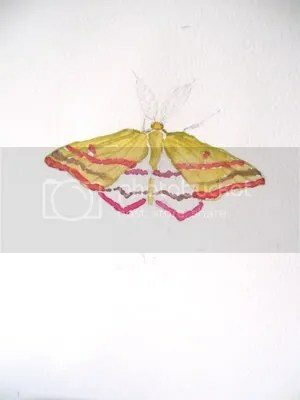 Let’s Paint the Chickweed Moth! Oh Boy! 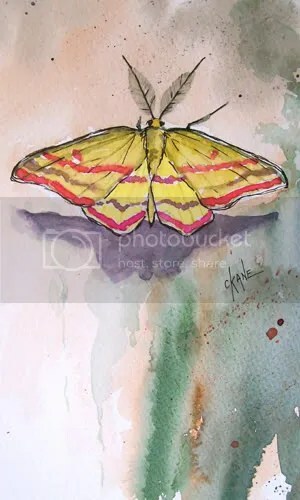 You’re really going to love this step by step watercolor painting of how to paint the male chickweed moth because it’s sooooo EASY! Step 1: Make a rough sketch in pencil on 140lb. cold press watercolor paper. 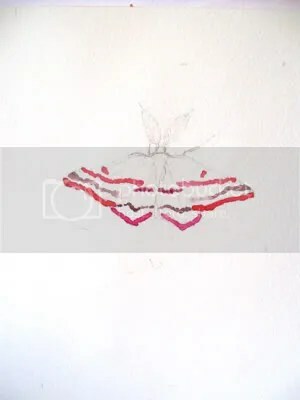 Step 2: I like the color pink and he does too so just for fun, let’s start with his beautiful pink stripes first, why not. I used perm. rose for the bottom wings. For the forewings, I mixed the perm. rose with a bit of yellow ochre for warmth. Some of his stripes are almost purple, so I mixed perm. rose with a little indigo. 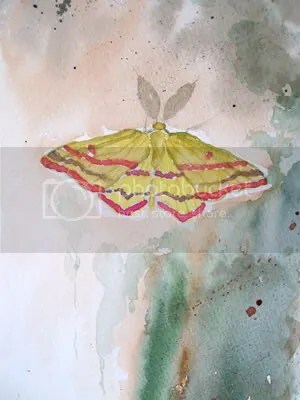 Step 3: In my picture, there was a shadow on his forewings and the light was shining on his underwings so when I paint my forewings, I used yellow ochre and a tough of sap green to tone it down. When almost dry I took a small rigger brush and a darker green mixture and painted some lines in his wings going right over his pink stripes. 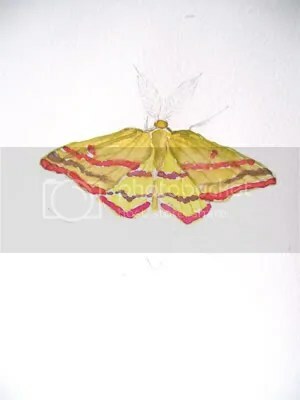 Step 4: Next, because the light is on his lower wings, I painted them winsor yellow. Nice and bright. Step 5: Background. I love runny, splotchy, messy backgrounds. It’s not hard, it only looks hard and it’s a bunch of fun! Wet your background around the moth. 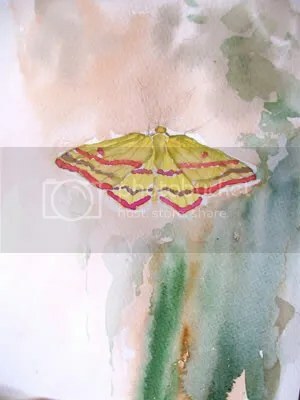 While the paper is wet but not shiny, load your mop brush with burnt sienna, paint around the moth. Quickly load your brush with sepia and do the same in certain spots only…where ever you like. Time to get dirty! 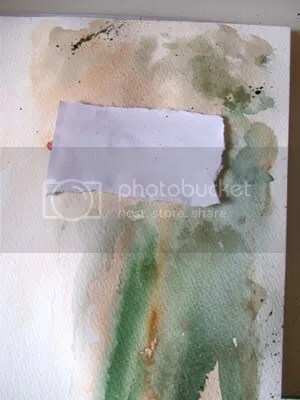 Next, load your brush with indigo, pick a spot and actually squeeze your brush with your fingers on the paper as your paper is standing up so the excess paint can drip down. Repeat with sap green or any color you want. Don’t worry if this looks too dark, watercolors always dries lighter. Step 6: Where did he go? This step is also a bunch of fun and get ready to get your fingers dirty again. 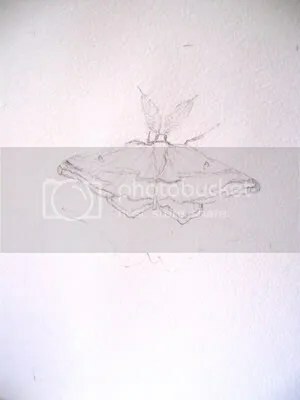 After your background is dry, cover your moth man with some paper, load a stiff bristle brush with a dark color, I used sepia. Flick your paint on the paper to make some interesting patterns. Don’t worry where it lands. Let the paint go where it wants to go. Step 7: For this male’s antenna, because we cannot see every individual line, paint a gray shape with a mixture of colors on your pallet. Step 8 Final: Now just a few details. First, paint his shadow with a purple color. I softened the bottom edges of the shadow with clean water while wet. Lastly, I outlined some features of the moth with a #3 Micron black pen. He really looks good now. This painting will be available for sale tomorrow at the Little Red Schoolhouse Art show. Maybe I will see you there? Just came across your blog, your paintings are excellent, you have a great talent. I’ve added you to my blog roll, I love how you focus on nature in your blog. Very cool, as usual! How’d the art show go? All things nice: Thank you so much, it means a lot.